Brick and stucco and a grand covered entry embellish the exterior of this regal traditional, while inside, the contemporary floor plan flows for easy family living. Ceiling heights are eleven feet in the foyer, living room, dining room, and bedroom/study, and tray ceilings add stature to the living room, family/breakfast, and master bedroom. Stately interior columns accent the formal dining room. Laden with luxury, the master suite features screened porch access, his and her walk-in closets, and a magnificent bath with dual vanities, a garden tub, and separate shower. 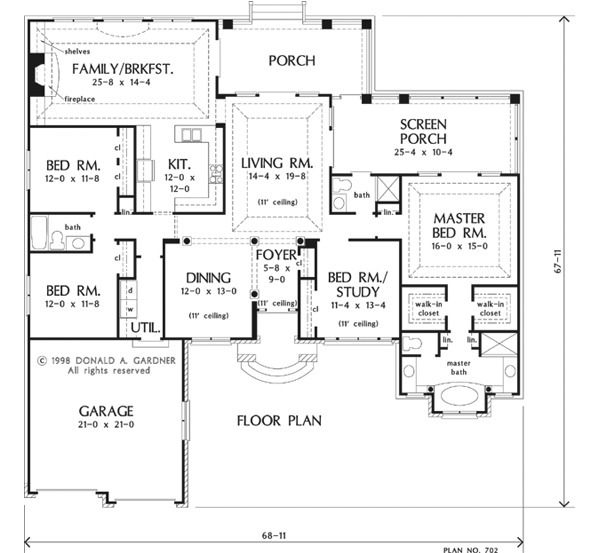 A bedroom/study is nearby, while two additional bedrooms are positioned on the opposite side of the house. 1st Floor: 2441 Sq. Ft.
Porch - Screened: 286 Sq. 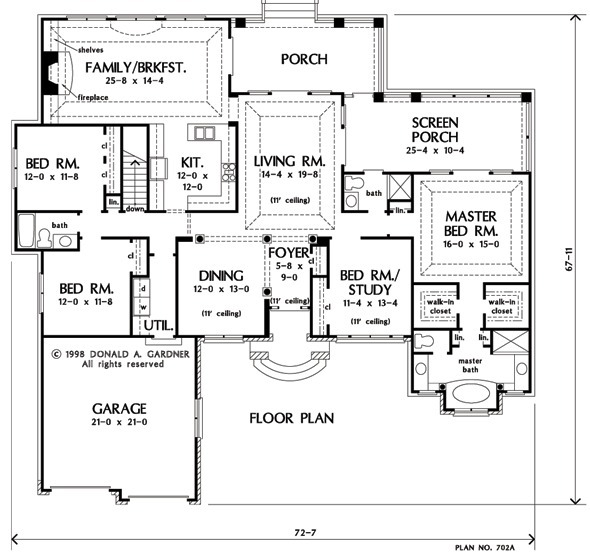 Ft.
House Dimensions: 68' 11" x 67' 11"
Great Room: 25' 8" x 14' 4"
Foyer : 5' 8" x 9' 0" x 11' 0"
Dining Room : 12' 0" x 13' 0" x 11' 0"
Great Room (Tray): 25' 8" x 14' 4" x 11' 0"
Breakfast Room (Tray): 25' 8" x 14' 4" x 11' 0"
Master Bedroom (Tray): 16' 0" x 15' 0" x 10' 6"
Bedroom / Study : 11' 4" x 13' 4" x 11' 0"
Bedroom #2 : 12' 0" x 11' 8" x 9' 0"
Porch - Front : 5' 8" x 8' 0" x 0' 0"
Porch - Rear : 21' 2" x 10' 4" x 0' 0"
Porch - Screen : 26' 0" x 11' 0" x 0' 0"
Living Room (Tray): 14' 4" x 19' 8" x 11' 0"